So much has been written about W.G. Sebald and the use of photographs in his novels that it seems almost fruitless to write further around the subject. With it being one of the defining features of his work, and with a rapidly increasing library of volumes and handbooks exploring the writer’s legacy, I struggled to initially frame the subject I want to write about here: my almost obsessive collecting of portraits of the writer. With there being such a finite number of pictures of the author, the drive to find more photos of him seemed a puzzle to me at first; I initially could not recall the first instance of where this passion derived from or what I thought these photos could tell me about the writer and his work. But two recent revelations about my own relationship to Sebald’s work have led to understanding why I find something so poignant in his pictures as well as why I believe they can expand an understanding of his methods. The first of these came when recently revisiting Grant Gee’s documentary, Patience (After Sebald) (2012) for an interview series I was conducting. Sebald’s use of photos was another tool in his critical analysis to corner Walser’s work and, unlike the act of walking several of the routes that made up his books, I think there’s something incredibly useful in turning this particular method back upon the writer. In fact, I would go so far as to say that there’s something autobiographical in his analysis of Walser here that I find partly explains the pleasure I derive from finding pictures of him. The first place I believe to begin is in the more popular pictures of the author, all taken from later life and usually around Norwich where he last taught. These images typify the essential impression of Sebald as that mixture of scholar and writer. They define the man as always the older academician; thin glasses, white hair, white moustache. For a man who notoriously avoided and seemingly hated the publicity process of releasing a book, several of these images are surprisingly cheerful, or at least mischievous, and show a man far happier than the melancholic wanderer who seems to lead us through many of his novels. The photos above are clearly taken at differing points in the writer’s life, the middle image especially seeming much younger than the other two, yet the effect is the same to me: the defining of the man’s stock image. It is worth noting at this point that I’m not so much interested in the authorship of the pictures because knowing who they are by and when they were taken adds very little to understanding why I find them so interesting; everything is contained within the pictures over the backdrop of knowing Sebald’s work. Moving on to more obviously melancholic images, there are clearly several portraits designed in some way to reflect the character of Sebald’s narrators. I would even go so far as to say that it is the man in these photographs that I assume I am with when reading all of Sebald’s four novels: Sebald as witness to the last 300 years of worldwide calamity, now hanging heavy on his brow. Perhaps the best way to understand the character housed in these photos is to see the copy sheet from his photo shoot in Norwich cathedral. There’s almost a sense of wandering around the building in these photographs, the character becoming, or at least seeming to be becoming, more weary as the shoot and the short walk progresses. At the very least, Sebald’s absolute desired distance from this very process is perceivable: perhaps as a great manipulator of photography’s meaning himself, he can see the potential ghost of his voice captured and at the mercy of future viewers/voyeurs through this process. I skipped over the inclusion of the first colour photograph mentioned earlier because there are better and more interesting examples. I find colour photographs of Sebald incredibly odd, especially when they are clearly digital images (or early digital images). They bring his writing back to a very fixed point at the turn of the millennium; often a fact that I forget as his writing has been so much taken out of time, so to speak. But one photo I particularly like avoids this. 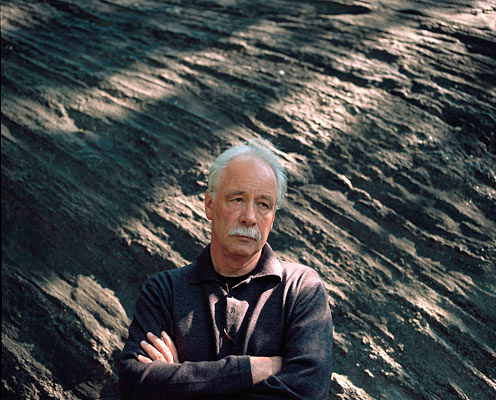 It conforms to my imagined colour palette of the 1990s, perhaps even the late 1980s, and shows Sebald in front of huge pile of logs. There always seems to be natural textures within the best of Sebald’s portraits, acknowledging that the landscape, no matter what some critics have said, is very much essential to his work even when simply as that background texture on which to explore and consider upon. In a similar picture, Sebald is seen standing in a very small perspective under a large tree. The image supposedly is taken from The Rings Of Saturn and yet I can’t picture how the image is framed in the novel; another mystery to explore on the next re-read. With searching out more and more images, gradually pictures of Sebald as a younger man begin to surface. These images seem incredibly alien, impossibly contrary to the dominant image of the great writer with his grey hair, glasses and moustache. Perhaps that’s why I find a quiet, rebellious brilliance in them; I can completely believe, far more so than in the older images, of this young man – staring into camera, smoking a huge piper in a river – having his criticism deemed as overly harsh by Theodor Adorno no less (an occurrence documented in a letter from the philosopher regarding Sebald’s thesis). This is the Sebald that wrote that thesis and would arise in the more academic and even controversial of modes, seen most overtly in his published work A Natural History Of Destruction. His is the spectre of the most unlikely of angry young men. One of these younger pictures shows the writer capturing a portrait of himself in the mirror; the only picture I have found that shows the writer actively taking photographs. It’s a wonderful quirk of fate that it happens to be of himself as if he fictionalised his own persona from the very outset. Because of this, the image has the feel of capturing something secret, not usually seen as it could break the illusion of the pictures in his novels. Equally, however, it could even aid them; planting the writer firmly into his journeys in the visual sense rather than just as the purveyor of the images from behind the camera; the unreliable narrator now exposed by the celluloid. Morphing back to the older man, there are a number of photos capturing the rise of his literary career; meeting admirers, sitting with translators and visiting artists’ studios. These are fascinating in that their candid nature again breaks apart the image of the untouchable genius, reminding that he was very much a working academic and author right up until his death. It seems essentially obvious in saying this yet few writers have risen so quickly into the pantheon of great literature, seeming untouchable now after death; the ghost haunting on, impossible to touch. I find one of these images particularly startling, showing Sebald meeting an admirer at an event where the fan seems to be trying to look like the author. In terms of Sebald’s writing, full of mysteries surrounding his perception of the self standing on the brink of a deep time, it’s enjoyably unusual but probably far more mundane a meeting than sketched out here. I still take enjoyment in considering Sebald discussing his work with a seeming mirror of himself, another trick still being played out on his mind by the heath-land of Dunwich. Another image that connects to ideas of Sebald meeting his own ideas is one taken by Tess Jaray in her studio in 2001 not long before Sebald was killed. Jaray had worked on screen-prints paired with quotes from Vertigo and The Rings Of Saturn, Sebald visiting her studio at the time. The aspect that sticks out most is Sebald’s small cigarette, the only other picture I can find of Sebald actually smoking. It instantly dates the picture in an interesting way, again locking it into that period before 2007. A colour version exists too. With Sebald’s work so often dallying with ideas of travel, especially walking, a number of amusing photos exist that now seem to ironically play heavily with the writer’s identity as a perambulatory persona. This is because the photos show Sebald on a variety of different modes of transport: on a bicycle, a horse and tractor. It’s almost comedic with Sebald recalling Jacques Tati’s Monsiour Hulot more than anyone else in the first instance. With movement in mind, Sebald’s passport has also been scanned and is now in public due to its printing in Vertigo. The photo instantly conjures the scenario of the man travelling around Europe and reminds in particular of the instance on the train in the book when he is irked by the behaviour of his fellow passengers. It’s the most overt transplanting of his own visual into his novels though it is also telling that this was his first book and not something that would be so readily repeated in the following novels. A fitting, if somber, image to conclude upon is a photograph, not of Sebald himself, but of his writing desk. The image marks the absence of the writer beautifully and cannot help but be tinged with his death through hindsight. The man is there, as a spectre dutifully meandering over his own potential as we sit in wait for the future novels that were never to be. Photographs of W.G. Sebald still hold mysteries for me but, unlike with other writers, I hope that they remain that way; never to sit within the context of reality which would, like a bone in the sand, render them finally seen.